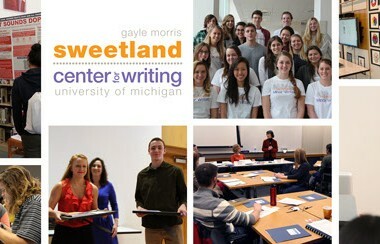 Last April, the Sweetland Center for Writing graduated the first cohort of our Minor in Writing. Students from two sections of our Minor Capstone course, as well as their families, gathered in North Quad to receive their certification and speak about the experiences in the program. Anyone wandering past the ceremony would have seen a familiar exchange, even a traditional one (unless, of course, they happened to stop by at the moment our robed and hooded faculty serenaded the students with a program-customized version of “Margaritaville”). But what the ritual of commencement disguised is the radical variety and the scale of ambition characteristic of the Minor in Writing and its students. 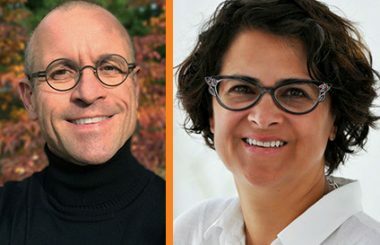 Since the program was initially conceived as an opportunity for students within and across multiple disciplines to pursue their interest in writing, the academic diversity our first cohort possessed is a mark of success. We believed that students wanted more opportunities to write and to think about writing, and they proved us correct. Pedagogically, however, getting them in a program and then figuring out how and what to teach them are very different tasks. Simply put, what do you ask a room full of students of neuroscience, history, sports management, museum studies, philosophy and medieval literature to write about? As a microcosm of the depth and array of inquiry that makes the university great, these students presented each other with an opportunity that was also a challenge. Happily, challenge is a concept our minors welcome, which is why they responded with such inventiveness and diligence in the Capstone course when we told them they would each be responsible for proposing, designing and executing their own writing projects, which they would then place in the context of a digital writing portfolio that would narrate and elaborate the evolution of their undergraduate writing altogether. The development of these portfolios brought the students to a shared task, while the writing of the projects preserved the integrity of the individual student’s interest, abilities, and scholarly aptitudes. And of course, the cohort itself offered as ideal an audience of passionate readers – both empathetic and critical – as a writer could want. Although this challenge demanded from the Capstone instructors the absolute utmost in finding ways to both provoke and serve their students, the work itself more than compensated for the effort. Teaching the Minor in Writing Capstone affords a teacher a rare and thrilling preview of these students’ futures, as we see how they will draw upon all they have learned to make new things, new forms and ways of knowing, new ways of reaching and inventing readers and communities. As we are fond of saying around the office, we call it a minor, but the commitment it bespeaks is major. The first section of our second graduating cohort is even now strategizing and wondering and making the most of the opportunity the Minor in Writing presents. They have familiarized themselves with the projects and portfolios of our first class – students to whom we are forever grateful for their willingness to help us fine-tune the program – and they are a bit intimidated. But they also see those achievements as a challenge, an invitation, and we are certain that this April they will show us once again what they are capable of, and why writing is their way forward.